Our goal is to understand how patterns of neural activity arise in prefrontal circuits and how those patterns influence behavior. A major focus of the lab is on dopaminergic projections from the ventral tegmental area (VTA) to the medial prefrontal cortex (mPFC), which regulate critical functions that are frequently disrupted in psychiatric disorders. VTA neurons fire in distinct modes and modulate neuronal activity – in part – by acting at D1 or D2 dopamine receptors. 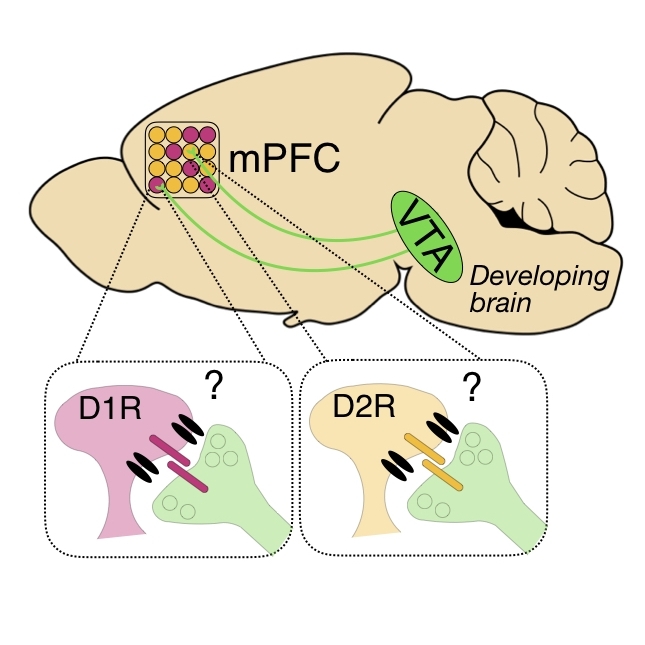 In mPFC, D1 and D2Rs are expressed by unique cell types with distinct connectivity. However, it remains unclear how prefrontal dopamine alters patterns of neural activity in prefrontal circuits to influence behavior. Furthermore, we lack an understanding of how dopaminergic modulation of prefrontal activity is altered in disease and subsequently impacted by successful clinical interventions. To address these questions, we employ cutting edge techniques for neural circuit analysis, including imaging activity with head-mounted miniature microscopes, in vivo optogenetics and transcranial magnetic stimulation in rodents. We collaborate extensively to address related questions about the development of dopaminergic projections and their influence on prefrontal circuit maturation. Using in vivo optogenetics, miniscope Ca2+ imaging and accompanying computational analyses we will examine how activity patterns in specific mPFC subnetworks gives rise to prefrontal-dependent behavior (e.g. effort-based decision making). We will ask how clinically-relevant manipulations (e.g. stress, medication, exercise) influence these underlying mechanisms. Using viral tracing, confocal analyses of dendritic spines and slice electrophysiology, we will examine the mechanisms VTA-mPFC circuit assembly. We will ask how dopaminergic input arises and how it influences the maturation of prefrontal circuits. We will examine the influence of stressful early-life experiences on this development. Transcranial magnetic stimulation (TMS) effectively treats several neuropsychiatric conditions by modulating electrical activity in cortical circuits. However, the mechanisms mediating this efficacy remain largely mysterious. We will use miniaturized TMS coils to develop a rodent model for investigating how TMS influences prefrontal circuits. Martin EA, Muralidhar S, Wang Z, Cervantes DC, Basu R, Taylor MR, Hunter J, Cutforth T, Wilke SA, Ghosh A, Williams ME (2015) The intellectual disability gene Kirrel3 regulates target-specific mossy fiber synapse development in the hippocampus. ELife Nov 17;4. Besterman AD*, Wilke SA*, Mulligan TE, Allison SC, Hagerman R, Seritan AL, Bourgeois JA (2014) Towards an understanding of neuropsychiatric manifestations in fragile x premutation carriers. *Equal Authorship. Future Neurol. Mar;9(2):227-239. Wilke SA, Raam T, Antonios JK, Bushong EA, Koo EH, Ellisman ME, Ghosh A (2014) Specific Disruption of Hippocampal Mossy Fiber Synapses in a Mouse Model of Familial Alzheimer's Disease. PLoS ONE 9(1): e84349. Wilke SA, Antonios JK, Bushong EA, Badkoobehi A, Malek E, Hwang M, Terada M, Ellisman MH, Ghosh A (2013) Deconstructing complexity: serial block-face electron microscopic analysis of the hippocampal mossy fiber synapse. J Neurosci. Jan 9;33(2):507-22. Wilke SA, Hall BJ, Antonios JK, Denardo LA, Otto S, Yuan B, Chen F, Robbins EM, Tiglio K, Williams ME, Qiu Z, Biederer T, Ghosh A. (2012) NeuroD2 regulates the development of hippocampal mossy fiber synapses. Neural Dev. Feb 27;7:9. Williams ME, Wilke SA, Davis E, Daggett A, Ripley B, Klein G, Ghosh A (2011) Cadherin-9 regulates synapse-specific differentiation in the developing hippocampus. Neuron. Aug 25;71(4):640-655. Scobie KN, Hall BJ, Wilke SA, Klemenhagen KC, Fujii-Kuriyama Y, Ghosh A, Hen R, Sahay A (2009) Krüppel-like factor 9 is necessary for late-phase neuronal maturation in the developing dentate gyrus and during adult hippocampal neurogenesis. J Neurosci. Aug 5;29(31):9875-87. Sopher BL, Thomas PS Jr, LaFevre-Bernt MA, Holm IE, Wilke SA, Ware CB, Jin LW, Libby RT, Ellerby LM, La Spada AR (2004) Androgen receptor YAC transgenic mice recapitulate SBMA motor neuronopathy and implicate VEGF164 in the motor neuron degeneration. Neuron. 41(5):687-99. Wilke S, Thomas R, Allcock N, Fern R (2004) Mechanism of acute ischemic injury of oligodendroglia in early myelinating white matter: the importance of astrocyte injury and glutamate release. J Neuropathol Exp Neurol. 63(8):872-81. Thomas R, Salter MG, Wilke S, Husen A, Allcock N, Nivison M, Nnoli AN, Fern R (2004) Acute ischemic injury of astrocytes is mediated by Na-K-Cl cotransport and not Ca2+ influx at a key point in white matter development. J Neuropathol Exp Neurol. 63(8):856-71.